Ever since I first heard Luke Wroblewski talking about the concept of Gradual Engagement, I had an immediate “Oh, why didn’t I think of that?” moment. To put it simply, Gradual Engagement is the process of allowing a user to explore what you have to offer, before deciding if they like it enough to actually sign up for it. Gradual Engagement doesn’t force a user to register first. 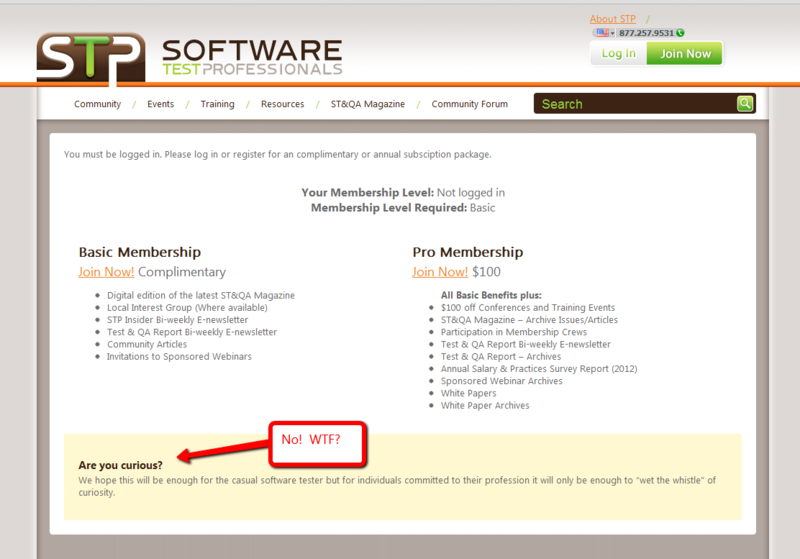 Software Test Pro, forced engagement. When attempting to access a podcast, I’m forced to engage into an unwanted membership, be that free or not. If it does, you don’t even realize it has occurred! 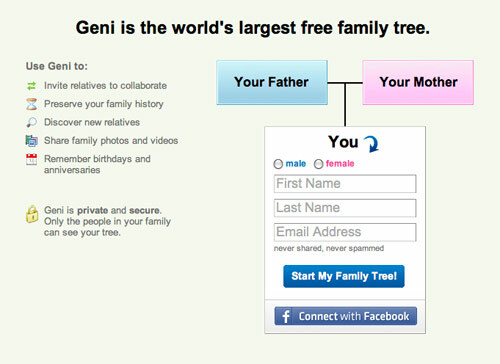 geni.com’s old design used to make the family tree creation process double as a transparent sign up process. Why should you be forced into an unwanted engagement, when all you want to do is get a feeling for something? Crazy huh? I’m sure CEO’s all around the world are scratching their heads thinking, surely if they register first, I’ll have more chance of keeping them? No! Half of the battle is getting people to register in the first place. The sight of a big ugly old registration form is enough to make a lot of people turn around and run for the hills. Furthermore, so many forms capture needless information just to fulfill some pointless metric, or open up avenues for the company to spam you. Yes, users feel harassed at being asked for more information than they should do! Why should they trust you? Forcing users to jump over fences to get information that they want is not the way forward! Most importantly, Gradual Engagement isn’t new! It’s been around for a decades. Remember shareware, freemium business models and the more recent spin liteware (no exact wiki reference sadly)? These are all similar concepts. Get people interested first before making them part with their hard earned cash. The phrase Gradual Engagement is simply far more self-explanatory, and in turn makes itself more useable as a medium for making others see sense. So what on earth has all of this got to do with Software Testing? Well if you think testing is merely about checking if software works or not, then I’ve probably lost you somewhat. Don’t worry though; testing is much, much more! Testing is among many things, caring about the success or failure of your product. Part of the success may be investigating how people will interact with your software, and trying to proactively avoid them wanting to throw in the towel at the first hurdle. By removing the hurdle in the first place, you give your product a fighting chance of actually being adopted by someone and not simply thrown away. Good testers care about these things. They think holistically, not just about what’s in front of them today or tomorrow. So moving on, we are starting to see consoles of all things getting their own apps. Fantastic! I can fast forward 20 years into the future and see myself never having to leave my couch! The wonderful thing about consoles though, is that it’s a new paradigm to play with. It is all very new so we can expect many great successes and many great failures. For Gradual Engagement there is one excellent example of both already. NetFlix provide a video application for the Xbox, which allows you to watch media content. After downloading and launching the app you’ll be asked if you are a member or not. Fair enough, but if you aren’t a member your next screen, instead of being a navigation paradigm to explore and preview their vast array of content (which they so want to show off), instead you are presented with a sign up for a free trial option. So not only do you have to fill in a form of some kind, but you’ll also have to engage in a trial which you may, or may not remember to cancel should you no longer wish to use it. For all you know, you might not even like it once you’ve signed up for it, so why the hell would you want to go through the hassle in the first place? The damndest thing though, is that unlike web paradigms which have lots of interactive elements, the Xbox app is a linear process, so I can only ever go forward (sign up for trial), or back (exit app). Pretty stupid, if you ask me! ILoveFilm on the other hand, also have an Xbox application, but wait! Listen carefully and keep this between ourselves for now! ILoveFilm let you preview their content, they let you watch movie trailers, they even let you search for films you might want to watch and better still, you haven’t had to give them any information yet! It is your choice if you want to proceed further and engage with them in the form of a mutually agreed contract. You haven’t been forced into something that you might regret later! So go forth and tell the tale of the benefits of Gradual Engagement to anyone who’ll listen. Make your company some more money and don’t forget to tell them who told them about it when you ask for that bumper pay rise! I suppose the companies could track to see how many visitors quit before signing up – but I wonder if they do bother doing that ? I like being able to put a name to a concept. What I like even more though is when that name is sensible and appealing to the ears. That being said, there will be many names in many different software houses for this concept. You’ll know yourself, in each company there is buzzwords for everything, many often distinct to that software house. It is sad to think that many of them trundle along in isolation, unaware of the larger community online that they can learn from. Anyway, on your point of tracking users. It would be interesting, at least then if site visit levels don’t vary much and they did opt to switch to a Gradual Engagement model, they would have data to justify the switch. I’ve been promoting this kind of accessibility to premium websites I’ve created for years and found that most of the Directors I work with would rather go with the sign up first scenario. This just gives people a chore before they can make a decision on whether they want to join the site or not and most will just navigate away. I know the feeling, it is often a big ask and unless you have the solid data to back it up, it can be hard sometimes for others to accept. What I find as well is that those in positions to purchase new sites or application designs often feel, or require the need to gather metrics to appease their own bosses. This is often why we end up capturing more needless data in forms to the annoyance of users. Hopefully as more household names adopt this strategy, others will tag along. A halfway house I see touted by some organisations is the concept of a ‘quick reg’. Could this be considered a facet of gradual engagement? I looked into Netflix a few weeks ago and wanted to know whether they had ‘The West Wing’ in their catalogue. I couldn’t see it in the preview to non-customers and was unwilling to sign up to find out they hadn’t. I ended up sending a message out to facebook asking if any friends who HAD signed up could tell me whether it actually was in the catalogue. US friends said yes, but UK friends said no. - Hey Del, you not signed up yet? - DEL! Why don’t you like us? Sign up! Gradual engagement? I’m on board…. Exactly! Why is it that companies can’t grasp that people are precious about their personal information? Build up a level of trust first by allowing the user to engage with you, should they want to. On the quick sign up process. Sure I would consider that an huge improvement, but depending on how it’s done. Like you said, perhaps it will still be a forced engagement. It is certainly a step in the right direction though. 3rd party login mechanisms, such as logging in via Twitter, Facebook and so on; I find these are extremely usable and I would class them as a form of gradual engagement, due to the ease and transparency of the interaction. As for Netflix, perhaps they’ll learn the hard way? Your experience is like mine – frustrating!